Movie: "Good Night, and Good Luck"
CBS reporter Edward R. Murrow takes on Senator Joseph McCarthy and his communist witch hunt during the Red Scare. Every once in a while throughout history, there have been people who have risen to power and have used that power to further political agendas at the expense of personal liberties, all in the name of national security. Luckily, the news media is there to keep people informed and to keep those in power in check. "Good Night, and Good Luck" is the story of one such moment in our history. Directed by George Clooney and written by Clooney and Grant Heslov, this film tells the story of Edward R. Murrow (David Strathairn) and his role in ending Senator Joseph McCarthy's communist witch hunt. McCarthy used the political climate of fear in the 1940s-1950s to his advantage. In the name of national, global, and personal protection, he justified infringing on the rights of the American people. As the head of the House Un-American Activities Committee, McCarthy led the charge against anyone and everyone who he thought to be communist with or without evidence, often going on nothing more than hearsay, conspiracy theories, or a simple accusation to accuse them of espionage as communist spies for the Soviet Union. We haven't seen "Good Night, and Good Luck" in over a decade and boy does it hold up in our eyes. It is a wholly engaging drama about a critical moment in American history that not only impacted the time in which it happened, but it also affected the entire future of our country moving forward. George Clooney does a fantastic job capturing the era in what is easily his best directorial effort. It is shot in black and white and is often shown through a thick haze of smoke since Murrow is hardly ever seen without of cigarette. Clooney combines this filmed footage with actual newsreels and commercials of the era, which is a smart move in our minds. It really feels like something that took place in the 1950s, which is something directors can only pray happens to their period pieces. Honestly, this is not something that is achieved often because most films feel too polished and new to be and look dated. 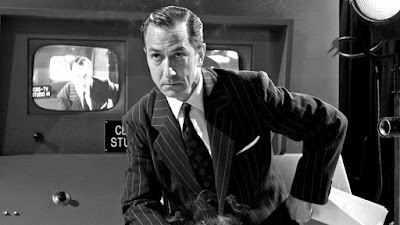 David Strathairn gives a brilliant, compelling, powerful, nuanced performance as Edward R. Murrow. 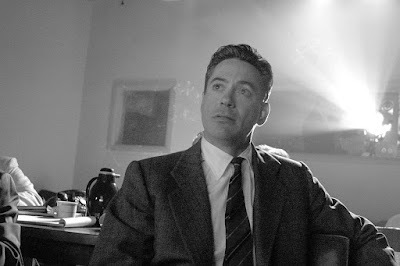 Strathairn manages to match the mannerisms, the tone, and the appearance of Murrow almost entirely. There is also a great supporting cast here, including the likes of the goofy Robert Downey Jr., the incomparable Patricia Clarkson, the serious Jeff Daniels, the stern Frank Langella, and even George Clooney himself. There is a unique mix of charm and humor to go along with the substantial dramatic weight that arouses a sense of hope and pride in Murrow's viewers despite that things often look grim for America. 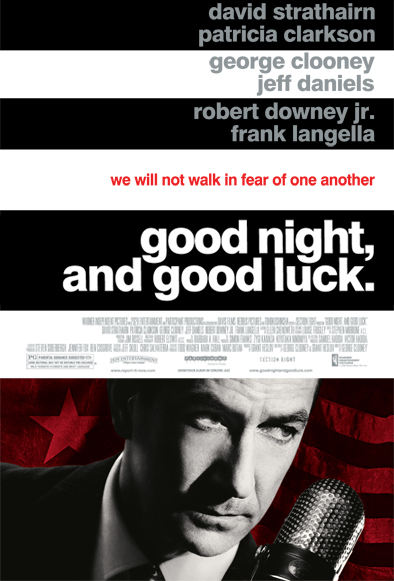 "Good Night, and Good Luck" is just as impactful today as it was in 2005. It was nominated for six Academy Awards, and even though it didn't take any trophies home, it doesn't take away from just how incredible this movie is. 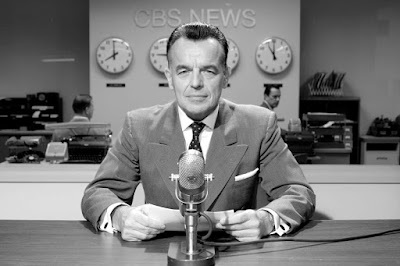 It would have been an astounding thing to witness Murrow's broadcasts as they happened each night on television. Thanks to George Clooney, we've been allowed a small taste of what it must have felt like to hear Murrow's mighty, confident, piercing words in real time. George Clooney really hit the nail on the head with this engaging film.